Wedding pew decorations have come a long way, since the basic pew bow! Don't get my wrong, I am still a big fan of the pew bow. There is something awfully romantic about the gauzy tulle draped between the pews, tied with a pretty bow. Don't limit yourself to the traditional when thinking about your wedding pew decorations. To make your design memorable, why not add a twist to the classic favorite? If you want to keep it simple, layer colors of tulle together, or choose a decorative knot instead of a bow. If you really want to get fancy though, there are several fun options to try. 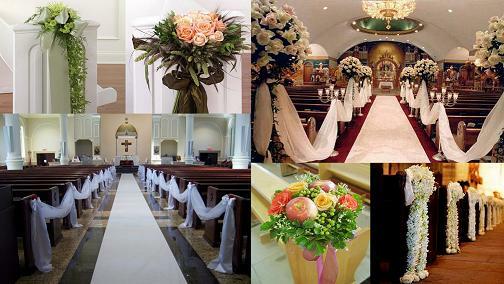 Drape tulle between your pews, to create a barrier from the aisle way. Secure the tulle at every pew with a pew clip. Instead of a bow use a small plastic hook (available in most floral or art supply stores) to hang a miniature tin flower container. Fill the container with Aqua-foam or Oasis floral foam and arrange spring flowers inside. Use spring colors like cotton candy or lilac. Finish with a fun spring ribbon. Use a bright colored organza, available at most fabric stores for a dollar. The organza will create a fuller drape and add more vibrant tones than tulle can offer. Add sparkle to your aisle design by using crystals or beaded garland. Drape the garland along with the fabric and secure at the pew with a crystal brooch. Use Summery colors like tangerine or raspberry and bright crisp greens, like chartreuse and celery. For a fall twist on wedding pew decorations, use brightly colored fall leaves to crate rich color tone. You can add other elements along with the leaves, like pumpkins, gourds or branches. Instead of a pew bow, instead use pheasant feathers, Indian corn or fall leaves. You can glue these to a pew clip in advance. Arrange your design in a way that will keep the pew clip from showing, and make certain that it is glued securely before attaching it to the pew. Add flowers if you wish, but the feathers alone will still look very nice. Instead of fabric, drape live evergreen garland, (available at most floral wholesalers after Thanksgiving) Hang trimmings and ornaments in the garland all along the aisle. Secure the garland at each pew using a pew clip. Use seasonal ribbon or a large ornament to cover the pew clip and complete your look. 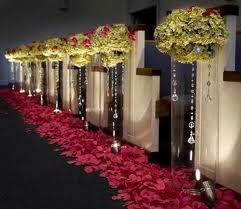 Return to Ceremony decorations from wedding pew decorations for more great ideas!